Crown Linen, founded in 2003 is a commercial laundry that offers luxury and full-service hotels outsourced laundry services. With facilities at Miami, Orlando, Fort Myers, Haines City and Bradenton, have become “the leading commercial laundry serving hospitality industry in central, South and Southwest Florida”, focused on improving client’s satisfaction with customized services and environmentally friendly processes. Crown Linen, looking to improve their processes , increase efficiency and quality approached ONPEAK Energy to perform an energy assessment to their facility located in Miami, FL, for a solution to reduce energy and maintenance costs. ONPEAK Energy, a Florida-based Efficiency Consultancy Company that works with energy saving solutions, designed an LED lighting system that allowed Crown Linen to save money and improve quality and light levels across the facility. ONPEAK was able to create a customized turnkey solution that had no negative cash flow impact and allowed Crown Linen to get this project done without impacting their budget; all the investment is paid back by savings and rebates generated with the new and more efficient lighting system. ONPEAK’s design took into account the interior and exterior lights of the property. The interior lights, included office, workshop and warehouse areas. The retrofit of the interior lights with new and long-lasting technology fixtures brought along not only energy savings but also significant improvements for laundry process itself. The improved lighting levels provided by the new LED fixtures reduced the number of returned pieces with quality issues since the staff was able to detect stain spots easier, furthermore, the team was pleased with the new uniform lighting distribution especially the night shift’s crew. The maintenance savings were also a key issue, due to the 24 / 7 operating schedule of Crown Linen, access to replace broken lamps was limited and interfered with operative tasks. With the new LED Lighting system, Crown Linen assured five years of continuous operations without interruptions. The power and maintenance savings estimated for Crown Linen Miami were $29,800.00 per year, reducing 170,645 kWh per year; also ONPEAK helped Crown Linen to collect incentives of $76,000, yielding a payback of less than a year. This turn-key project mitigated all risks that were a concern to Crown, as Pablo Lucchesi, the Managing Partner at Crown Linen stated: “The process was very simple to follow, we received a full proposal with costs, savings, projections and financing that allowed us to implement the solution without a negative cash flow impact.” After installation, savings were validated and rebates were collected, further easing the process for the client. 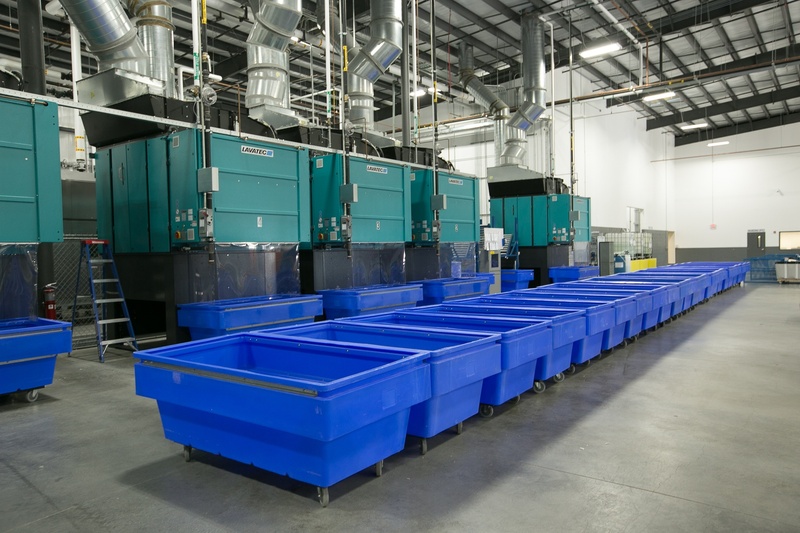 After this success at Crown Linen Miami, ONPEAK was invited to implement a similar solution at three additional Crow Linen’s facility looking to achieve similar results. With ONPEAK’s solution, Crown Linen was able to update their lighting system to an LED power efficient system, improving their lighting levels up 40% across the property. The project allowed Crown Linen to save $29,800.00 every year in electricity and maintenance. The new lighting levels improved the staff’s working condition enabling them to detect defects on linen before delivery, reducing significantly returns from hotels. For Crown Linen this was a risk-free project since no up-front payment was required, savings were measured, and equipment and labor was paid with its savings.